Geert Mul (1965) studied art from 1985 -1990 at the ABK Arnhem where he graduated with computer animations, video and kinetic sculptures. After his studies, he traveled in Mexico, the United States and Asia. He resided for one year in Tokyo. The connection with Japan remained ever since, colouring his perception and works. Since 1993 Mul lives and works in Rotterdam, Holland. In the mid-1990s, Mul became one of the first VJ’s, creating and showing video and computer animations in the alternative Techno scene. These events grew into interactive audio visual installations which he showed in a variety of contexts, from museums to pop festivals. Mul has been exploring for over 25 years the possibilities of a poetry in the language of new (data-based) media. This resulted in a flow of experimental artworks in a wide range of media: prints, light-objects, video and interactive/generative computer installations. Mul’s practice engages the broader public through audiovisual-performances and commissioned artworks in public space. He has produced over 20 commissioned art installations in schools, hospitals and other buildings and has performed and exhibited works in the Museum Boijmans van Beuningen Rotterdam, Museum of Modern Art New Delhi, Stedelijk Museum Amsterdam, the International Biennial Torino, Ruhr European Capital of Culture 2010, The National Museum of Modern Art Kyoto Japan, Museo Nacional Reina Sofia Madrid, Institute Valencia Arte Moderne, Museum of contemporary Art Chicago, Museum of Modern Art Chengdu and the Dortmunder-U in Germany. Mul considers his works as analogic constructs: correlation, association and speculation are the main ingredients of his creative methodology. For Mul, art is an poetic exploration and enrichment of media-language and ultimately of perception.Mul teaches at the Gerrit Rietveld Academie (Amsterdam) Interactive Design – Unstable Media. Geert Mul is represented by gallery Ron Mandos, Lives and works in Rotterdam, Holland. In 2010 Geert Mul received the Dutch Witteveen+Bos Art & Technology Award. 2016 Special Jury Award – Lenticular Print Award: Lenticulair Cloud for Deloitte Head Office Amsterdam. 2015 International FIAT/IFTA Award: -Most Innovative Use of Archive- in collaboration with The Netherlands Institute for Sound and Vision. 2011 -Best Practice Award- Virtual Platform Holland. 2011 -Share Prize- nomination Museum of Science Turin Italy. 1993 – present: Media artist, artistic research, commissioned art public space. 2008: Co-founder Baltan Media Laboratories, Eindhoven. 2008 – 2012 Creative Board Baltan Media Laboratories, Eindhoven. 2004 – 2012 Creative board Showroom MAMA,Rotterdam. 2001- 2004 Commission ‘international projects’. Mondriaan Foundation. 2018 EYE Film Museum – Amsterdam Light Festival: Databased Dialogues, Projection mapping on the surface of the Eye Film Museum Amsterdam. 2017 Arts Chiyoda, Tokyo Japan, CommandN 20th Anniversary, video works. 2017 Dortmunder-U, Dortmund Germany. Solo. Geert Mul, Matchmaker 25 years of media-art. 2016 Stedelijk Museum Schiedam. Solo. Geert Mul, Matchmaker 25 years of media-art. 2015 Metro al Madina & Yunkunkun club, Beirut Libanon @ Global week for Syria, Big Data Poetry. Audio Visual performance with Michel Banabila. 2015 Dutch Institute for Sound and Vision. Hilversum, collaboration. “Ander Nieuws” Disclosing the database of Dutch broadcasted news (1953 -2014) interactive installation. 2014 Logan symposium Barbican center, London. Big Data Poetry. Audio Visual performance with Michel Banabila. 2014 Stuk Kunstencentrum, Leuven Belgie PLEISTO-SCENE ARTEFACT Installation in public space. 2013 Strarta art Fair at Saatchi Gallery London. Interactive Installation SHAN SHUI. 2013 Stedelijk Museum Amsterdam at Trouw Big Data Poetry. Audio Visual performance with Michel Banabila. 2013 Tschumi Pavillion Groningen. (solo) Pleisto-Scene: Installation with prints and led-light. 2013 Raw China Expo Art Rotterdam. (group) Interactive Installation SHAN SHUI. Curator Piet de Jonge. 2012 Wood Street Galleries in Pittsburgh U.S.A. (group) HORIZONS Interactive installation. 2011 Gallery Ron Mandos Amsterdam. (solo) Gods Browser and other works. 2011 Share Prize nomination Museum of Science Turin Italy. (group) God’s Browser Interactive Installation, non-deterministic browser based on image analyses. 2011 International Public Art Manifestation 2011, Ankara Turkey. (group) Museum of Symbolic Debris. Twenty light-boxes in public space of Ankara. 2010 Witteveen + Bos Art & Technology, oeuvre award + exhibition (solo) Coincidence is never arbitrary. 2010 Ruhr European Capital of Culture 2010. Hagen Germany (solo) “Preparation for a possible future” Installation with 20 LED lights & 20 prints on 300 meters highway. 2005 National Gallery of Modern Art & Dutch Embassy, 11th Triennale India New Delhi, India (solo) The Order Of Things, Generative installation. 2002 ISEA, International Symposium on Electronic Arts Nagoya, Japan (group) TransferPoints Video. 1999 Mappe’ 99 Percorsi Urbani, Catania Sicily, Italy. 1999 Maritime museum Rotterdam ‘Harbour, Sound & Vision’ with Speedy J. 1999 SONAR festival, Barcelona, Spain. Video ‘La Dérive’ (1998, 20min.) Geert Mul, Sound by Speedy J. 1999 International Filmfestival Rotterdam Holland Video ‘La Dérive’ (1998, 20min.) Geert Mul, Sound by Speedy J. 1998 D.E.A.F. V2 Rotterdam “The best Real Live Show” Performance with DJ Alien & Liquid Media. 1998 Paard Den Haag NL. “The Best Real Live Show” Performance with DJ Alien & Liquid Media. 1995 International Filmfestival Rotterdam Exploding Cinema ‘Disco Cinema” with DJ Alien & Liquid media. 2014 M S T, hospital entrance. Animated photographic print on glas with backlight light, 4,5 x 8,0 meter. 2012 Permanent artwork, public space: mural with paintings led light, Voorburg, Holland. 2011 Led sign for poetry and doggerel, City theatre Agnietenhof Tiel. 2010 Headquarters Royal Netherlands Army, Kromhout-kazerne, Archive projections. 2009 Loading Ready Run, Las Palmas building Rotterdam, I.C.W. Maurer United Architects, Interactive installation. 2008 Dutch Photo museum Museum Rotterdam, 3 permanent interactive installations. 2005 4 in1 building Breukelen, Interactive installations. 2004 Split Representation Higher School of Econoics Rotterdam (HES) NL Interactive installation. 2005 Soweto & Grahamstown, South Africa, Video design and live mix : Vuka! Vuka ! Het waterhuis theater. 2000 Dancegroup Krisztina de Chatel, Amsterdam, NL Multi-media dance performance ‘Dynamix’ Art director/ design interactive video. 2000 Museum of contemporary Art Chicago U.S.A. MCA summer Solstice celebration. ‘The best real Live Show’ with Liquid Media. 1999 Mappe’ 99 Percorsi Urbani, Catania Sicily, Italy Installation/ performance. With Peter Duimelinks. 1998 D.E.A.F. V2 Rotterdam, NL “The best Real Live Show” Performance with DJ Alien & Liquid Media. 1998 Paard Den Haag NL “The Best Real Live Show” Performance with DJ Alien & Liquid Media. 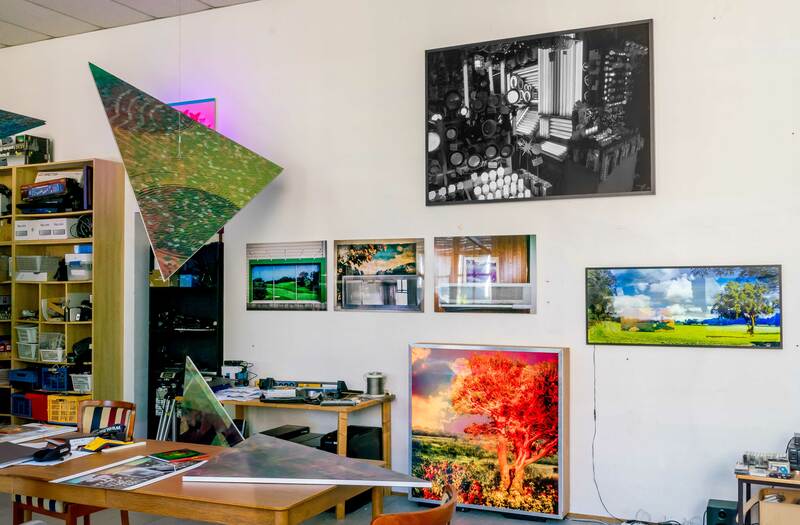 2015 Info-mania, de waan van de data, Prodentfabriek, Amersfoort. 2014 International Conference on Imaging at the Intersections of Art, Science and Culture, Istanbul, Turkey. 2013 Gerrit Rietveld academie Amsterdam: Browser Based: Artistic Big Data. 2013 National day of science Holland, Van Nelle Fabriek Rotterdam: Artistic Big Data. 2013 University of Leiden dep. Media-technology: Databased Perception. 2012 Gerrit Rietveld academie Amsterdam LAPS: advantages and disadvantages of a doctorate in art. 2013 University of Maastricht, Studium Generale: Generation 2.0 Art, Design and Media. 2011 STRP Festival Eindhoven: Interactive Design. 2011 Van Abbe Museum Eindhoven: De Stijl vs RGB, ism Baltan Laboratories. 2010 SKOR, Amsterdam A wedge between private and public public space and interactivity. 2010 BKKC, Tilburg: From LED screen to Media facade. 1999, 2000, 2001, DIESEL Italy DIESEL Italy. Fashion presentation & presentation video.